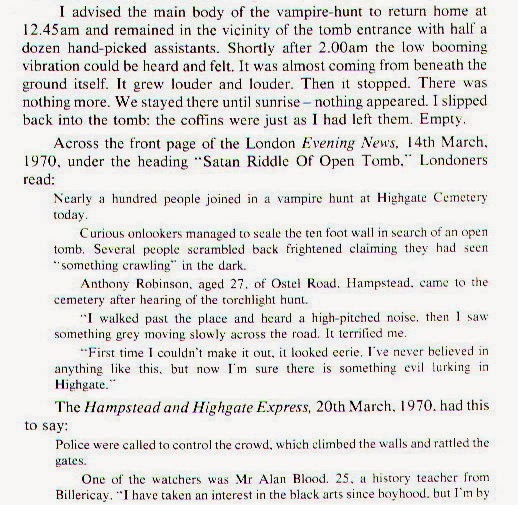 Forty-six years ago today the Highgate Vampire case was taken into the public domain for the first time in the form of a front-page news feature article headlined "Does A Wampyr Walk In Highgate?" 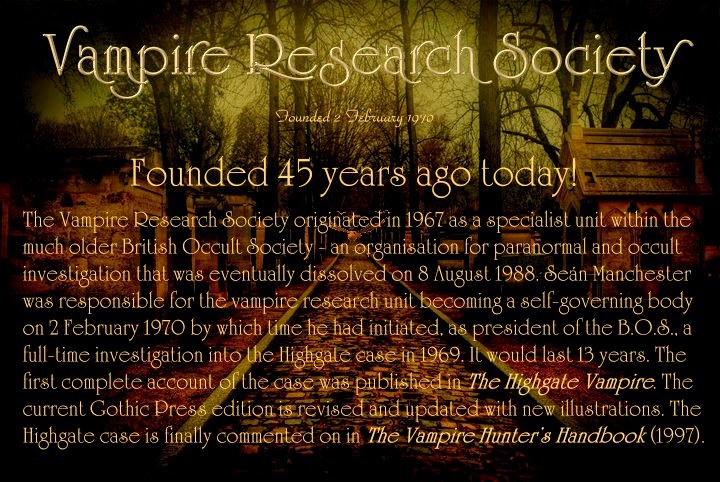 There was no mention of David Farrant in the article which focussed on the findings of the President of both the British Occult Society and the then fledgling Vampire Research Society. Many have since attempted to jump on the publicity-bandwagon that ensued, but none perhaps have been so desperate and compulsive as Anthony Hogg and his collaborators Trystan Lewis Swale and Erin Chapman who are currently trying to track down two females who have hithertofore enjoyed a very private existence. 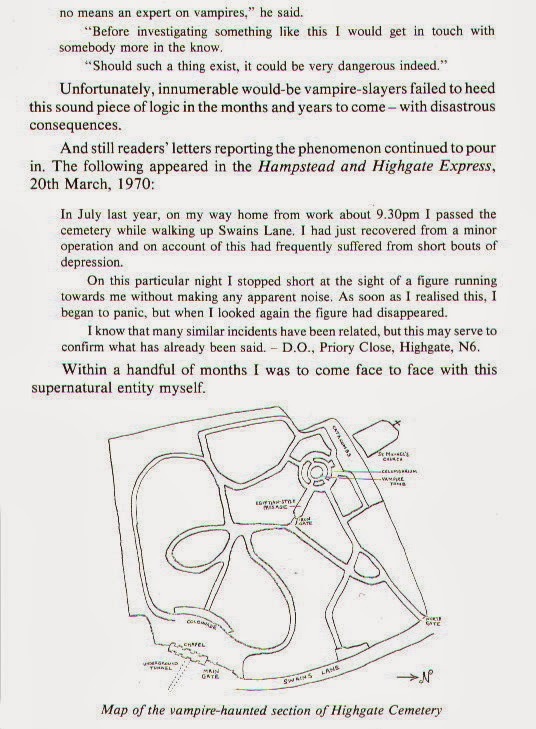 Kenneth Frewin, R Docherty, Julian McKennar, Audrey Connely and Nava Arieli (aka Nava Grunberg) were all identified as first-hand eyewitnesses in the Hampstead & Highgate Express, February — March 1970. Trystan Lewis Swale, Anthony Hogg and Erin Chapman are content to ruthlessly pursue Elizabeth Wojdyla while ignoring the other self-proclaimed eye-witnesses. Elizabeth Wojdyla was not identified by name in 1970, albeit she was referred to anonymously on television programmes that year. Mary Farrant and Colette Sully, although sympathetic to David Farrant at the time, might bring fresh evidence and certainly an unheard perspective. Females much less sympathetic to Farrant who were also identified by name in newspapers and magazines, eg Victoria Jervis, Nancy O'Hoski and many others, might equally shed new light on the goings-on in the 1970s. They have unique and privileged information. But you will find neither Hogg nor Swale nor Chapman showing the slightest interest in these females because they have no association with Seán Manchester. As David Farrant, now turned seventy, falls further into an undead slumber, Anthony Hogg, Trystan Lewis Swale and Erin Chapman have become his replacement, using pernicious propaganda originating with Farrant to pursue an identical vendetta against the exorcist Seán Manchester. They are this generation's clones of a clown who nobody took seriously back in the 1970s. Swale, who regards Satanists as being mostly atheists and is one himself, declared on his site yesterday that Seán Manchester "doesn't know much about Satanism." The implication is that these clones do and their undisguised empathy with the dark side provides common ground with the source of all the malice. "It was necessary to tell the full story, even though this was not an easy decision, due to the overwhelming public interest in the case﻿, but I really now feel the subject has been exhausted and all there is to say about it has been said. It has also exhausted me after decades of television and radio interviews, film documentaries and related projects concentrating on this one topic. There will always be people seeking to cash in and exploit my work for their own ends. Many, of course, will be too young to remember the happenings at Highgate. That notwithstanding, my book The Highgate Vampire is optioned for cinematic treatment, but that is not something I wish to elaborate upon here. "I am willing to quietly and privately set the record straight where need be, but I gave my final interview about this case to the broadcast media some years ago and have no intention of returning to the topic despite persistent requests from television and radio programmes for me to do so almost every week. 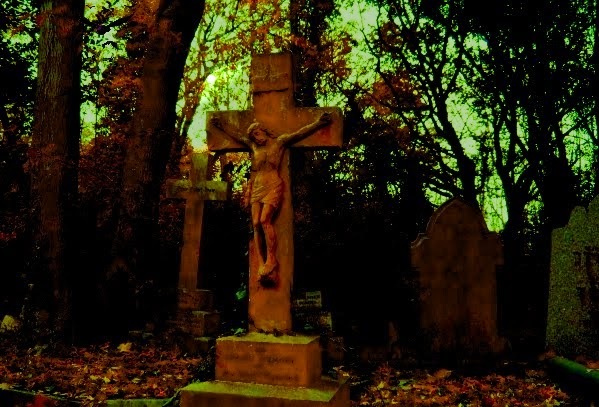 I still make contributions on unrelated matters, but this subject of intense public fascination — in some cases obsession — concerning events at Highgate Cemetery more than forty-four years ago is not something I have an appetite to return to any longer. Having said that, my memoir in its unexpurgated form obviously mentions the case in a proper and fitting context to my life. However, I have no plans to have my memoir published — now or ever. 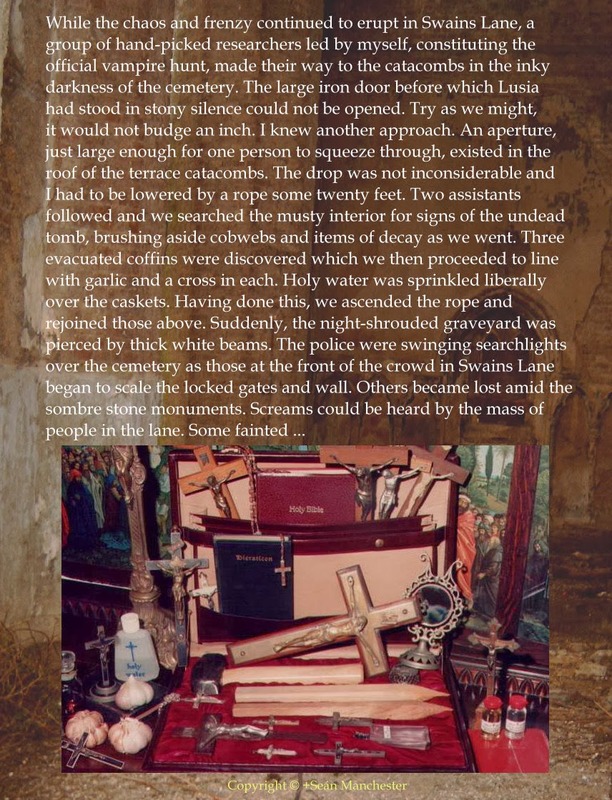 "Unimaginable horrors were experienced by folk at the time of the contagion and these I feel are best not evoked. They should be left undisturbed. The reality that I and others, most now sadly deceased, experienced all those many years ago no longer exists, and next to the hunger to experience the supernatural, albeit in this case at its most maleficent and deadly, there is perhaps no stronger hunger than to forget. "Should an individual have a particular query about those mysterious happenings, I will give that person an answer (but not an interview); otherwise I have too much in the present with which to be concerned without reliving nightmares from the past." 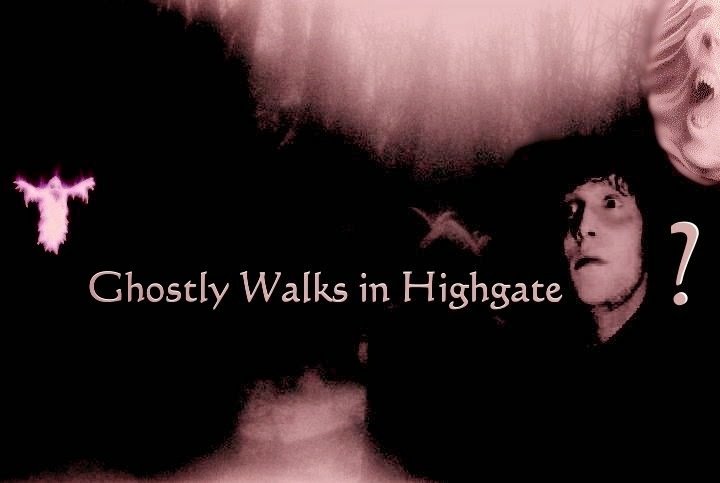 Does A Wampyr Walk In Highgate? The banner headline "Does a wampyr walk in Highgate?" appeared across the front page of Hampstead and Highgate's most prestigious newspaper in February 1970. 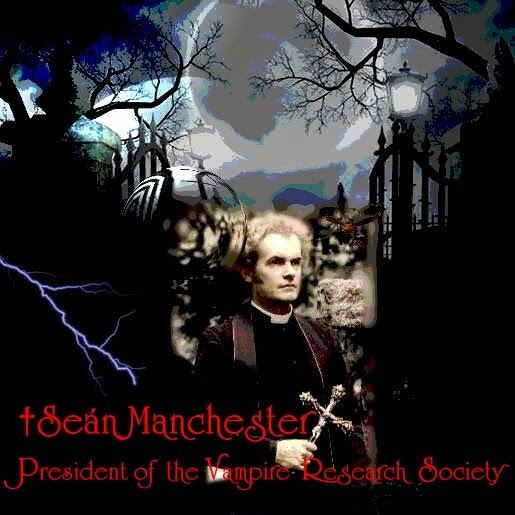 The editor himself had written the piece after meeting privately with the president of the British Occult Society and founder of the then fledgling Vampire Research Society. He allowed himself to get slightly carried away by introducing the journalistic embellishment "King Vampire of the Undead" - a term that Seán Manchester did not employ, as stated by him on page 72 of The Vampire Hunter's Handbook, but what else did the editor get wrong that day? Apparently more than you might imagine! 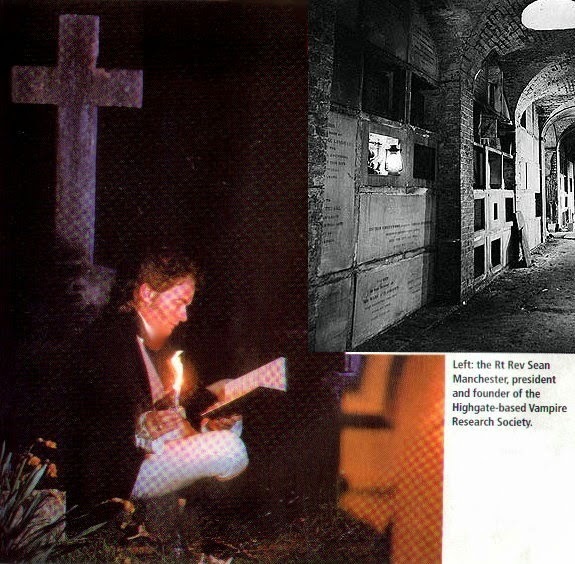 After warning that a vampire might be active in Highgate Cemetery, the article goes on to correctly describe Seán Manchester as a photographer (he had run his own photographic studio throughout the previous decade) and the president of the British Occult Society (a position he held from 21 June 1967 to 8 August 1988 when the BOS was dissolved). He is then quoted accurately enough before reference is made to a King Vampire of the Undead which is not attributed to him in actual quotes but attributed nonetheless. A very important residence in Highgate somehow manages to transform into a different house in London's West End. For house "in the West End" one should actually substitute Ashurst House, which once stood at the western end of the site now occupied by Highgate Cemetery, as would have been explained by Seán Manchester who told the editor at the time that Ashurst House was sold and leased to a succession of tenants of whom one was a mysterious gentleman from the Continent who arrived in the wake of the vampire epidemic that had its origins in south-east Europe. This is not quite the same as what was reported and, of course, does not have anything like the same sensationalist impact as "King Vampire from Wallachia"which Draculesque adornment the newspaper clearly preferred. There then follows reference to a group of Satanists attempting to"resurrect the King Vampire." This time the reference to a King Vampire is included in quotes even though the term was not uttered. Next we are misinformed that the British Occult Society had "no formal membership" but instead corresponded with "50 to 100 interested people. "Completely untrue. The BOS had a formal membership of over three hundred people with at least one hundred actively involved in ongoing research and investigation. Then we learn that the British Occult Society "believes in countering magic by magic" when all that was said is that the supernatural will not submit to scientific methods to measure and prove its existence. 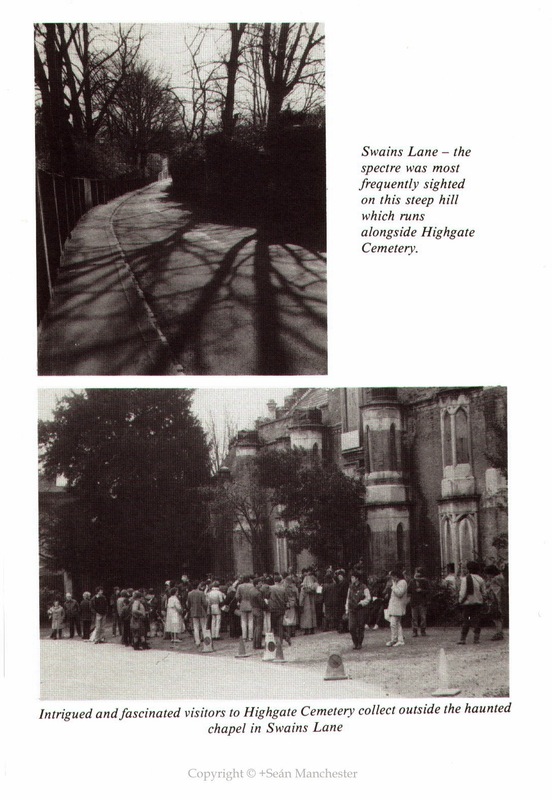 The newspaper correctly states that some BOS members had "spent nights in Highgate Cemetery" which was obviously for the purpose of observing the strange nocturnal goings-on in the place as had been reported by people in the previous decade and was still being reported up to the time of the article. 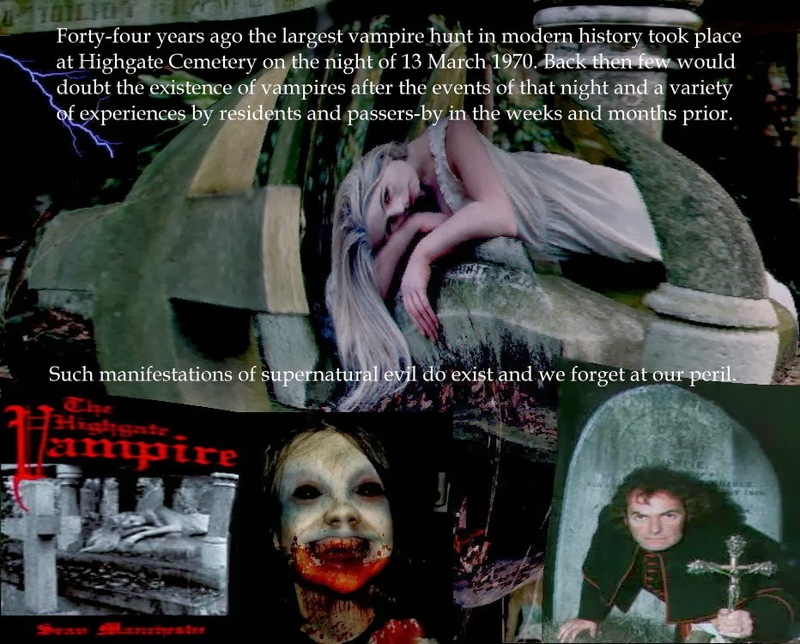 Readers are then offered in quotes "the traditional and approved manner"by which folk must rid themselves of this hideous pestilence without it being properly clarified that this is how clergy dealt with the problem in centuries past and was not on the agenda as far as the British Occult Society/Vampire Research Society was concerned with regard to Highgate Cemetery. That Montague Summers' books bore some influence on Seán Manchester's understanding of vampirism is mentioned in tandem with the suggestion that Bram Stoker's novel is based on fact. That Stoker was influenced by genuine cases and read about real vampires before writing Dracula is not in doubt, but the clumsy journalism of the Hampstead and Highgate Express clouds what is trying to be conveyed by the man they are interviewing in the pursuit (presumably) of economising on words for the sake of space. Finally we come to a quote attributed to "one of Britain's busiest exorcists, the Rev John Neil-Smith" (they couldn't even get his name right - it was actually Christopher Neil-Smith) by attributing to him the following: "I believe the whole idea of vampires is probably a novelistic embellishment." He said nothing of the sort. 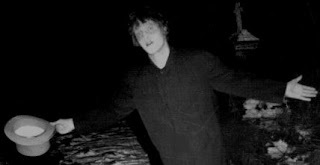 The Reverend Christopher Neil-Smith (1920-1995) was an Anglican priest, originally from Hampstead, most celebrated for his practice of exorcism and his paranormal interests. Like Seán Manchester, whom he knew, Reverend Neil-Smith believed that evil is an external reality and should be treated as such rather than as an abstract concept. The Reverend Christopher Neil-Smith, contrary to editor Gerald Isaaman's false attribution of 27 February 1970 in a local Hampstead newspaper, concluded that there really are such a things as vampires. 1. a b Beeson, Trevor (2006). "The Reverend Christopher Neil-Smith". Priests And Prelates: The Daily Telegraph Clerical Obituaries. Continuum International Publishing Group. ISBN 0826481000. 2. Sands, Kathleen R. Demon possession in Elizabethan England. Praeger Publishers. "At around the same time, Father Christopher Neil-Smith, an Anglican priest, received a standing license from the Bishop of London authorizing him to exorcise freely according to his own judgment." 3. Neil-Smith, Christopher. Praying for daylight: God through modern eyes. P. Smith. 4. Cramer, Marc. The devil within. W.H. Allen. "with the noted exorcist, the Rev. Christopher Neil-Smith, author of an anecdotal book entitled The Exorcist and the Possessed." 5. Spence, Lewis. Encyclopedia of Occultism and Parapsychology.Kessinger Publishing. 6. Mysterious Monsters (Aldus Books, 1978) by Daniel Farson and Angus Hall. 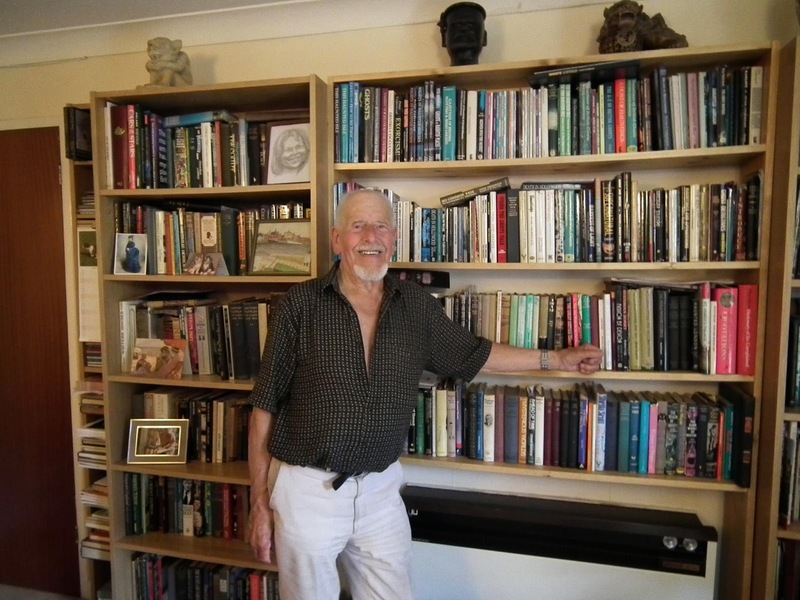 Author of over fifty books on the paranormal and Britain's foremost ghost hunter Peter Underwood has died. He made Seán Manchester a Life-Member of The Ghost Club (and later an Honorary Life-Member of the newly formed Ghost Club Society). 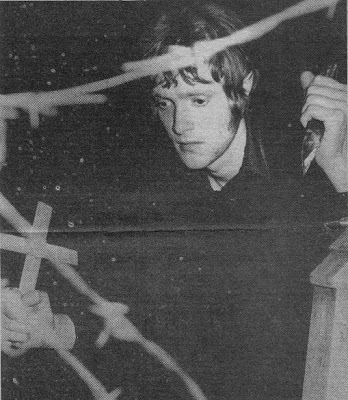 Peter Underwood, along with life-membership, was to become a Fellow Associate of the Vampire Research Society in 1973. He was already a member of the British Occult Society, an organisation that investigated the paranormal and occult phenomena, which was formally dissolved on 8 August 1988. 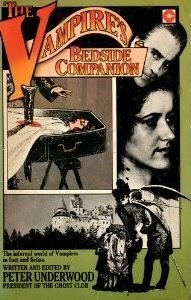 Its last President (1967-1988), Seán Manchester, collaborated with Peter Underwood on an anthology titled The Vampire's Bedside Companion (1975) that would include the first published account of early events in the Highgate Vampire case. He left it to his esteemed colleague to tell the full and unexpurgated story which he did ten years later when The Highgate Vampire was published by the British Occult Society in 1975. As already stated elsewhere by Seán Manchester: the sad passing of Peter Underwood irrevocably marks the end of an era. 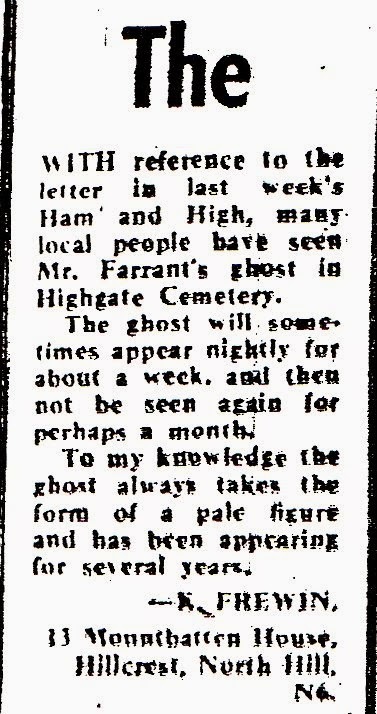 With the benefit of hindsight and a great deal of solid evidence we now know there was no ghost; indeed, we know that Farrant himself was the only "ghost" making an appearance at Highgate Cemetery in early 1970. 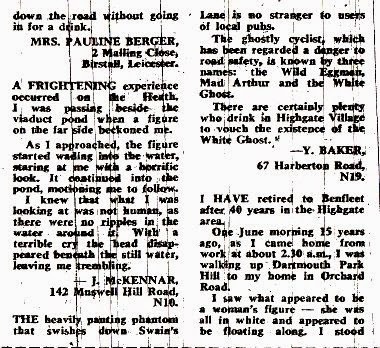 The following letters to the editor of the Hampstead & Highgate Express appeared immediately in the wake of Farrant's own letter claiming three sightings of a ghost-like figure at London's Highgate Cemetery. The first is written by Kenny Frewin, complete with Frewin's genuine address at the time. Kenny Frewin was and remains a close personal friend of David Farrant and often acted as his "minder" throughout the 1970s and 1980s. He also collaborated in further stories manufactured by Farrant in the press, but changed his name to "Kenny French" (on Farrant's advice) for that purpose. The second is also written by a close friend of Farrant. He knew both Audrey and her husband Michael Connely, the latter joining him and his first wife, Mary, whom he married in August 1967, on drunken forays with others to Highgate Cemetery after the pubs closed. Farrant altered her married status from "Mrs" to "Miss" when he came to write the letter using her name and address. The third letter is written by someone by the name of R Docherty who was also an acquaintance of Farrant. Docherty allowed his name and address to be used. There were others, Yossel Baker being one, who did not give permission for their name and address to be used. Farrant used it anyway. The fourth counterfeit letter to the local newspaper is attributed to "Nava Arieli" who, in fact, is Nava Grunberg (later to become Nava Jehans) who was undoubtedly Farrant's closest friend (and occasional girlfriend) at the time. The address is not hers. She lived in Hampstead Lane, and still does. The next couple of fake letters are no less interesting. Yossel Baker often drank in the Prince of Wales pub where Farrant was present with a couple of mutual friends, including Tony Hill. Baker's real name and address was used on the fraudulent correspondence without his knowledge. Farrant assumed that Baker would not be especially bothered about his identity being used in this way. One, Two or Three Vampire Sightings? Is it really plausible that Farrant's letter was so monstrously altered by the editor of a highly respectable newspaper to mean something quite different to what he had actually written? Is it likely that Farrant would not have insisted on having such a tampered version corrected in the following week's issue if this had really happened? There is no record of him having asked for any such correction. There is no record of an amendment appearing even though his contact with that newspaper remained ongoing for the next few weeks. 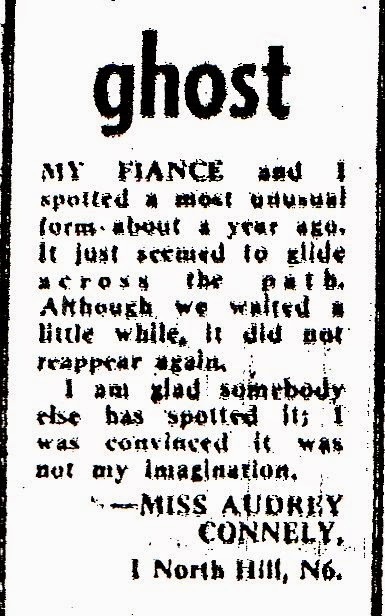 There are records of Farrant sticking with his personal "three sightings" account until October of that year when it suddenly reduced to "two sightings." Now it has become "one sighting." One is bound to wonder whether a further passing of time will establish "no sighting"? 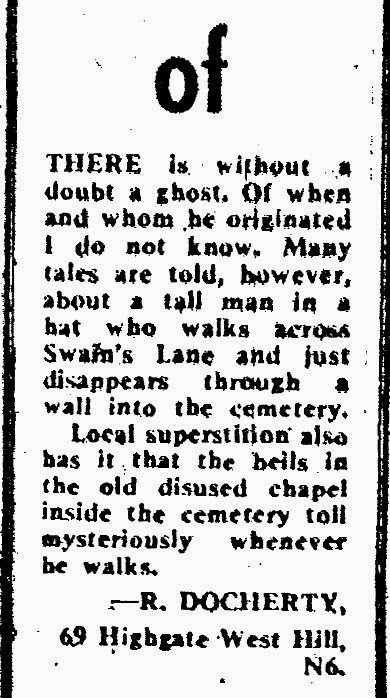 "On three occasions I have seen what appeared to be a ghost-like figure inside the gates at the top of Swains Lane. The first occasion was on Christmas Eve. The second sighting, a week later, was also brief. Last week, the figure appeared, only a few yards inside the gate. This time it was there long enough for me to see it much more clearly." The next month Farrant stated to Today interviewer Sandra Harris on British television: "The last time I actually saw its face." Does this not suggest there was a time previous to the one he is referring to in that interview? I sense it does. But there is more. There is the BBC's 24 Hours interview broadcast on 15 October 1970. 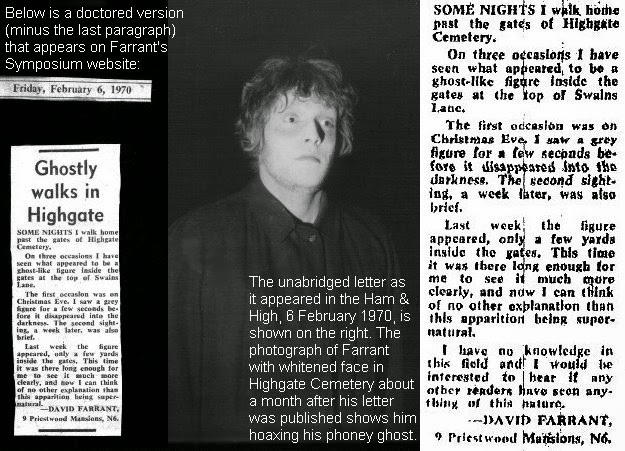 Laurence Picethly’s interview with Farrant for BBC television was sandwiched between footage of the President of the British Occult Society that had been filmed at the society’s north London headquarters and on location at Highgate Cemetery. The man representing the British Occult Society was obviously not Farrant even though the latter would fraudulently adopt that title two years later. 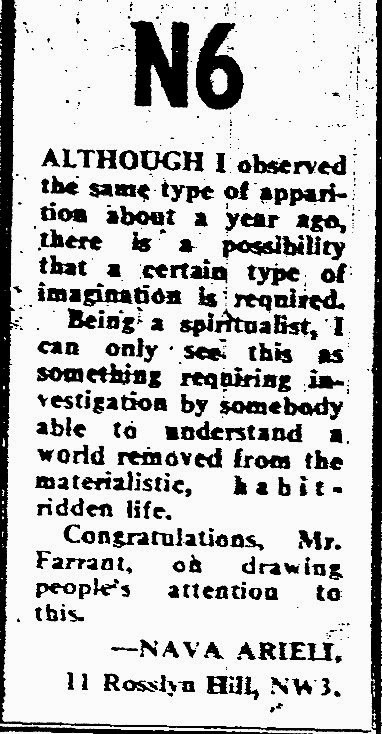 In fact, the British Occult Society had distanced itself from what Farrant was doing as far back as March 1970. The interview Farrant gave in late 1970 is important, however, because there are no editors for him to blame for altering what he had written in published correspondence to a newspaper. In the BBC programme he is seen speaking to the interviewer and the viewing public. The words can be heard from his own mouth and there is no escaping what he said. Farrant's interview ends at this point. It is reproduced above in its entirety. Farrant was acquitted of the charge that had led to his arrest, it being that he was found in an enclosed area for an unlawful purpose. Highgate Cemetery is obviously not “an enclosed area” and that is all he was charged with in August 1970. The BBC report now returns to the President of the British Occult Society. Three things are of significance in that BBC television interview from October 1970. 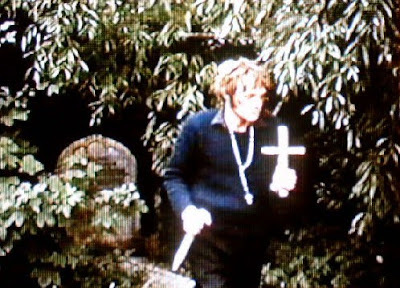 The reconstructed footage of what Farrant was doing on the night of 17 August 1970 clearly shows him hunting a vampire with a rosary around his neck, a large cross in one hand and a sharpened wooden stake in the other hand. 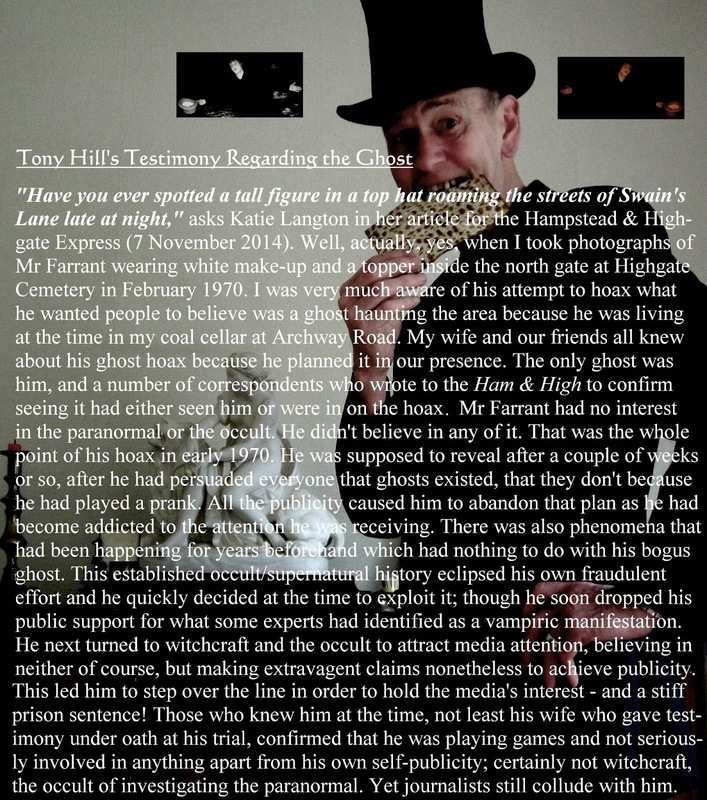 There is no ambiguity about what led to his arrest in this report where he is featured reconstructing what he was doing at the time of his arrest at midnight in Highgate Cemetery. The image above is taken from the 24 Hours programme as Farrant reconstructs the actions which led to his arrest. The second thing of significance is that when Laurence Picethly asks whether Farrant had ever seen the vampire, Farrant dis not attempt to correct the person interviewing him by saying it was something other than a vampire. 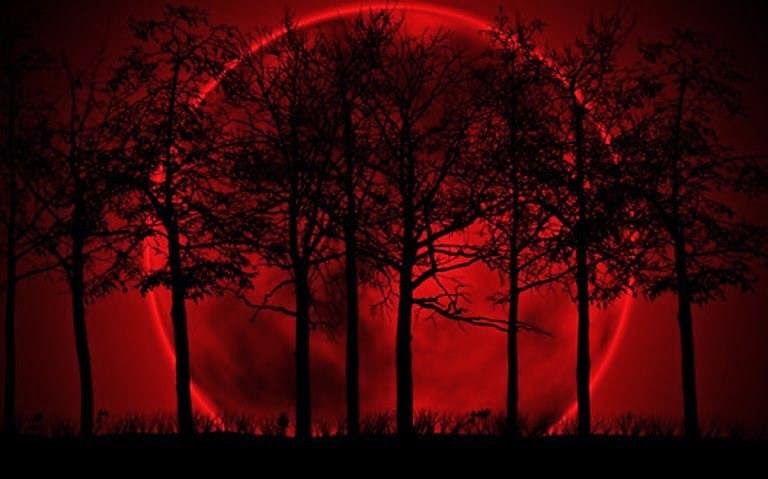 Nor did Farrant make clear that he did not believe in vampires, or that what he witnessed was not a vampire. Indeed, this section of 24 Hours was titled Vampires. The third thing of significance is that when asked if he had seen the vampire Farrant responded: “I have seen it, yes. 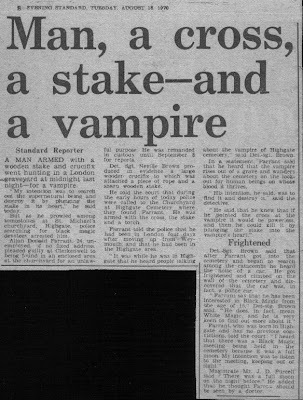 I saw it last February, and saw it on two occasions.” He can be heard saying that he had two sightings of the vampire in early 1970, but in the interview he gave Andrew Gough for Arcadia Farrant states that he had only one sighting and this was in December 1969, not February 1970 as stated by him in his BBC television appearance some four decades ago. My principal interest of vampirism falls within a more general fascination with the supernatural. To quote Seán Manchester (who quotes another vampire expert in holy orders): "Down the ages there has been no dispute between those who studied this phenomenon that a vampire is a predatory demon of the worst kind imaginable. Montague Summers, that vampirologist and author of an earlier generation, put it succinctly: 'Throughout the whole vast shadowy world of ghosts and demons there is no figure so terrible, no figure so dreaded and abhorred, yet dight with such fearful fascination, as the vampire.' Summers reminds us: 'There is no more terrible tradition that that of the vampire, a pariah even among demons. Foul are his ravages; gruesome and seemingly barbaric are the ancient and approved methods by which folk must rid themselves of this hideous pest.' Demons are certainly threatening; yet among that legion the most dreaded of them is undoubtedly the vampire."